Don't you just want to dive right into those brownies? I know I do! I made these delicious brownies for a friend's mom (and my friend) who recently had pretty invasive surgery. My friend and her family have had quite a stressful time lately with everybody in the family getting sick (including their 10 month old baby), then her mom's surgery. They are absolutely wonderful friends and I just adore her mom so I knew I wanted to bring something over when her mom was out of the hospital. Heat the oven to 350F. 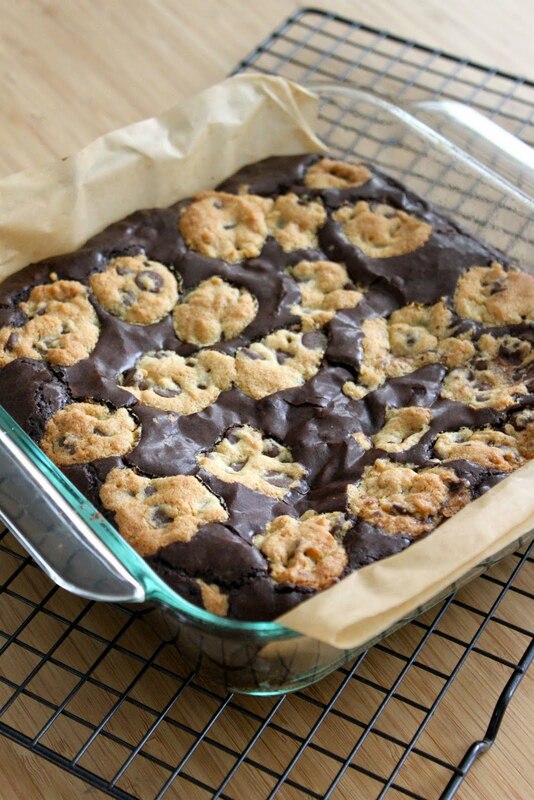 Grease an 8×8-inch square baking pan, line the pan with parchment paper, then grease the paper. Prepare Brownie mix as directed on package. Set aside. In a medium bowl combine the flour, baking soda, salt, package of vanilla pudding mix, and dash of cinnamon. In a second larger bowl beat together the butter, sugar, brown sugar and vanilla extract until creamy. Add the eggs one at a time, beating well after each addition. Slowly beat in the flour mixture until smooth. Stir in the chocolate chips. Pour the brownie batter into the prepared pan, spread evenly. 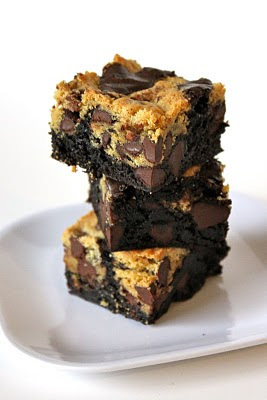 Drop teaspoons of cookie dough evenly over the brownie batter. Pushing the dough down so that it is level with the brownie batter. Bake for 25 - 30 minutes until cookies are golden brown and brownies are set. Cool completely before removing from pan. 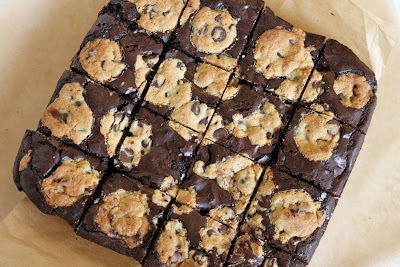 I made these today with my own brownie and cookie recipes and they were incredible! Thanks for the great idea! Otherwise thanks for the amazing recipe I loved it! I love Risa's cookie recipe! She taught me to freeze the extra dough in little balls to save for later. As a horrible cook/baker, they came out great, and my friends said the batch from the frozen dough were even better than the original batch.